Can you make users stay longer in my app? — As experience designers, we hear this question quite often. To address it we came to realize that it’s not enough to just design interfaces. We are talking here about designing to change and influence human behavior. Which is something behavior design is dealing with. Irrespective of whether you are on the client or developer side of a product launch at some point we are all faced with the same problem — how to get users to use your product? And not just use but hook them and make them stay longer in your app or better yet not want to shut it off at all? The struggle is definitely real and here’s how behavior driven design can help you overcome it. The study of behavioral mechanisms goes back to 1930. Back then Harvard professor Burrhus Frederic Skinner studied operant conditioning by testing his theories on rodents. In his pursuit to understand the nature of behavior, he put a rat into a box that contained a lever. When the animal pressed the lever a small pallet of food was dropped. Soon the rat learned to associate lever pressing action with getting food. The reinforcement it received formed a habit in the rat. These findings let Skinner assume that the same principles can be applied to any “operant” — be it a rat or a human. He called this invention Operant Conditioning Chamber which today is widely known as the Skinner Box. The general principle is pretty simple — focus on how the operants’ environment influences their behavior. You have to understand “the box” and then you will be able to get to the bottom of your users’ behavior. If you manage to create the right box with the proper reinforcement, you will be able to control their behavior. This idea can easily be applied to the development of digital products. Think about emails that prompt to instantly buy something, games or apps that grip our attention, or online forms that lead us to certain decisions — they are all designed with a single goal — to bend our mind and behave a certain way. With every iteration, they are becoming more elegant and subtle and now form a separate science — behavior design. This looks like a simple formula but to succeed all three preconditions have to be fulfilled. Thus trigger, a cue to action, is only valid when a person is highly motivated, or the task is straightforward. Contrary, if the task is difficult and a person has no opportunity to complete it, they will be confused. If the operant is not motivated, your hints will only irritate. You can argue that it’s impossible to induce someone to do what they don’t want. But you can guide users to do something they didn’t know they wanted. The desired action needs to be simple, and then you have a chance to convince someone to do it. Money: It’s the same as with time, the amount of resources is not equal to everyone. For instance, teenagers tend to have lots of free time but not as much money. The situation with adults is the opposite — more financial resources but less time. As a result, the notion of simple for these two groups is not the same as it is based on different factors. Physical Effort you need to perform an action. Brain Cycles: Refers to educational and experience level of users that may also vary. Social Deviance: Or is the action breaking the norm of the society? Not many will dare to attend a Vienna Opera Ball is their pajamas and slippers but what if it was a PJ-party? Both cases require the same action but one is more acceptable by the society. Non-Routine: By performing the same action regularly, a person builds up habits and skills which in turn affects the speed and simplicity of acting. 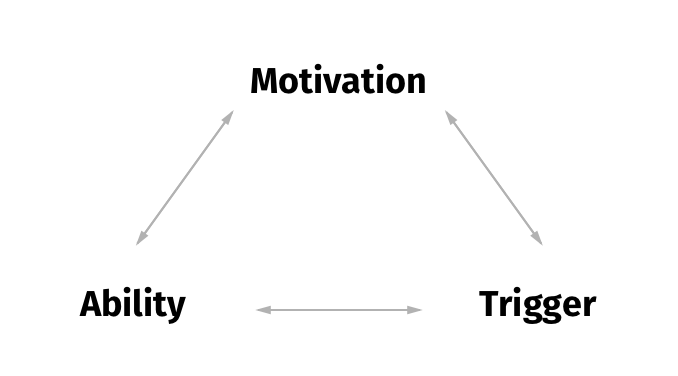 Back to Ability-Motivation-Trigger triangle, if you want to engage the user fully, you need to work on improving ability. Motivation is hard to predict. It requires time and effort. What you should be focusing on, is making the possibility of action as simple as possible. This will raise the chances of a user taking action. This principle was successfully applied to urge people to become organ donors. Organ donation rates are pretty consistent. In some countries, it’s around 80% while in others – 20%. It turned out that the critical factor why in some countries citizens were more willing to donate was the way a website form was designed. In countries with around 20% rate citizen had to opt-in to become donors, while in countries with 80% rates they had to opt out of donating. Triggers in their turn can be divided into external and internal. External or hot triggers are the ones designers can program: notifications, vibrations, a bubble with some updates, icons, etc. If a trigger is well designed or hot, it will find the users at the exact moment when their motivation is the strongest. 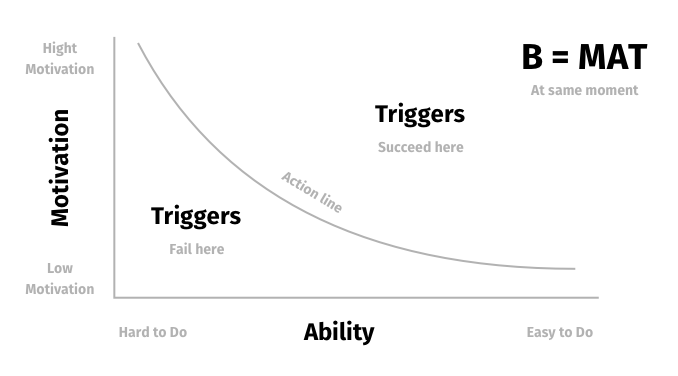 One of the essential ideas of behavior design according to Fogg: Put hot triggers on the way of highly motivated users. Internal triggers are more complicated. In this case, the information on what to do next is registered as a direct association in users’ mind and is built gradually. An app is only successful if it addresses the main emotional needs of its users before they realize they have them. For example, when we need an answer to a question, the first thing that pops into our minds is to google it. Feeling lonely? Why not browse Facebook? Bored? How about YouTube? No one prompts you to use these apps except for your inner trigger. The secret is, social apps appeal to the ultimate source of motivation – social interactions help us release dopamine, aka happiness hormone. 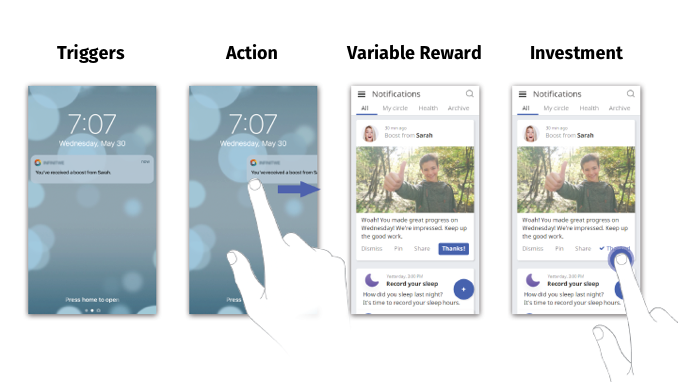 Particular attention here should be paid to onboarding, your opportunity to establish an emotional connection between a user and your product. It’s important to remember that this is the first time a user meets your app and first impressions are important. The more excitement your app produces, the more are your chances that your app will be users’ by default choice. So instead of telling them how to use your app, use this chance to explain the unique value your app will bring. 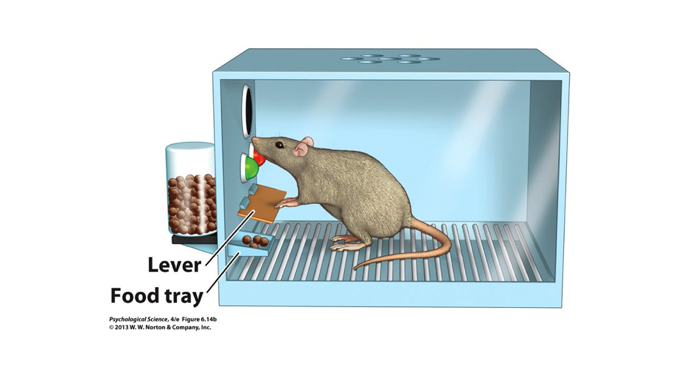 Another interesting observation Skinner noticed during his box experiments was that if a rat always receives the same reward for the action, it presses the lever only when hungry. However, if the amount of food was different every time, or at times there was no reward, the rat was pressing the lever nonstop. In psychology, it’s called the principle of variable reward. Why does it work? Receiving a reward increases the dopamine level and motivates to keep doing what brings you this reward. As the experiments have shown, the brain releases dopamine not only as you receive a reward but also when you’re just anticipating it. Unpredictable rewards lead to bigger dopamine splashes. Think about it, every time we open Instagram, Snapchat or Tinder, we never know if someone liked our photo, left a comment or messaged us. But the anticipation makes us reaching into a pocket and tapping that icon. The research on behavior mechanisms does not stand still. In 2014 Nir Eyal, former Fogg’s student introduced a hooked model of habit formation. He concluded that successful products are the ones that form a habit in their users. A habit is an action that happens always or almost unconsciously. It is built when our brain stops thinking over what to do next. Trigger — the behavior driving mechanism, external or internal. Action — behavior that involves receiving a reward. Reward — an intrigue, anticipation which causes a splash of dopamine. Investment — a moment when a consumer makes their contribution, an action that will improve the product or service the next time. 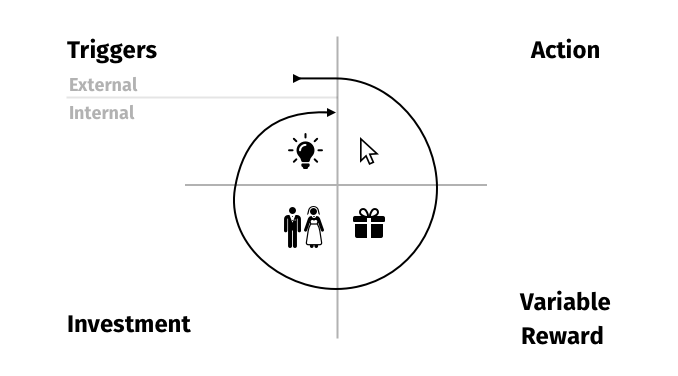 The moment of investment is when a user is asked to give a system something valuable (generally their time), which will increase the probability of the user being further interested in the product. Numerous experiments have proven, the more time and effort a person invests in a product, the more valuable this product is in this person’s life. Psychologists call this ‘IKEA phenomenon’ — people tend to value more the products they’ve invested into. For apps, this value a user has built by continuous investment is: some content, data, followers, reputation, gained skills. If you want users to spend more time within your app, you need to break down these investments into smaller, clearer steps. Start with simple tasks and gradually increase their complexity over the next cycles. To enhance this ‘hooked’ model, developers often resort to manipulative techniques. For example, by using the effect of a deficit, like indicating that a product you are viewing will soon run out of stock. Other popular methods are anchoring (buy this shirt and get 50 off your next purchase), the effect of environment (10 of your friends have already like this page) and the effect of continuous progress (loyalty cards and bonus programs). All of these methods are already integrated into our minds as consumers. News feeds and notifications have become entirely natural in the design of digital products. These techniques are already embedded in design patterns, and we use them all the time. The product has to be needed by someone. If no one needs it, then what the motivation to use it? It has to be simple to use. The more complicated the task is, the less motivated the users are. It should trigger users on a timely basis. Otherwise, people will forget about it. First impressions matter. It forms an emotional connection between a user and a product. The social aspect is one of the deepest forms of motivation. Other people are the best triggers. The product is up-to-date. People won’t use your product if it’s outdated. Test-iterate, test-iterate… You should always work on your product’s quality. But what we shouldn’t forget is that there’s a thin line between designing to form positive habits in our users and merely manipulating them. Is it manipulation when you’re trying to change human behavior in what you consider a positive way? There’s no universal answer to that question. What we have is business and important metrics on one side and people and their freedom of choice on the other. And designers in the middle, who can control which side to choose.